PLEASE ALSO NOTE: Beginning May 1st, I will temporarily stop taking orders for items from my web site, but will resume taking orders November 1st. During this break I hope to do a little 'dusting and cleaning' with the anticipated goal of updating my web site a bit. I will still continue with my monthly write-ups, and welcome your emails with questions about cartridges you'd like to identify or are wanting to sell, or to just say hello. Thanks for bearing with me. 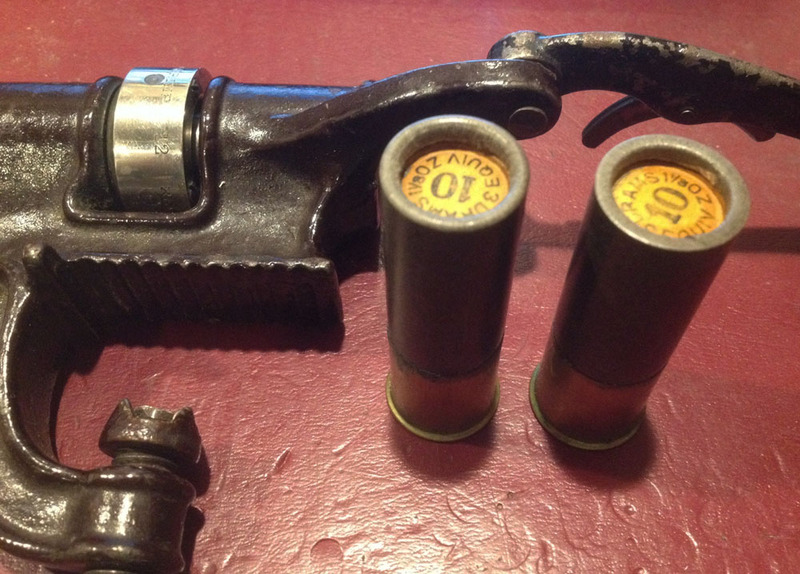 The shotgun shell crimper shown here was made by the Bridgeport Gun Implement Company (BGI) sometime around 1900. It looks and functions similarly to the many other brands of crimpers that were available at the time, and that are still quite commonly found today. 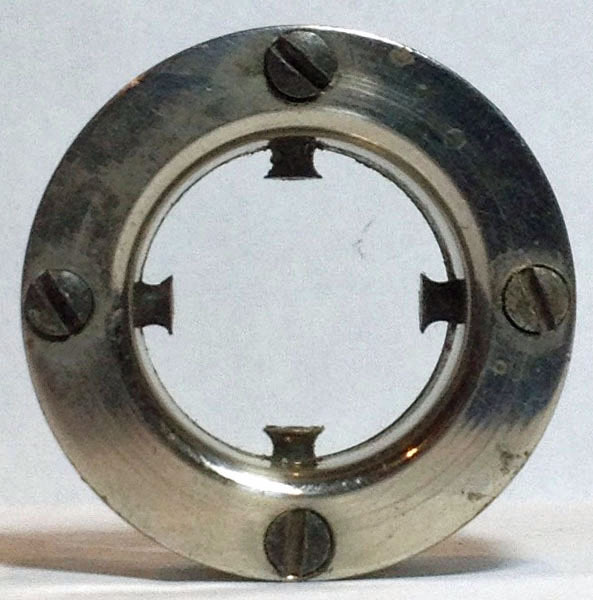 Like the others, it is made of japanned steel, has a screw clamp for attaching it securely to the work surface, and two handles, one for pushing the shotgun shell against the crimping head and the other for rotating the crimping head to form the crimp. 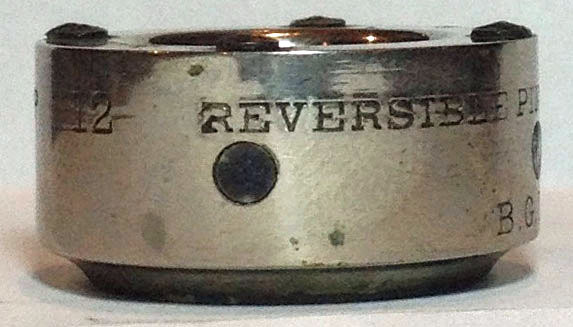 What differed on this crimper was it's shiny, nickel-plated crimping head which was marked in not-so-subtle, bold lettering 'reversible pins for round or square crimp' with a patent date. 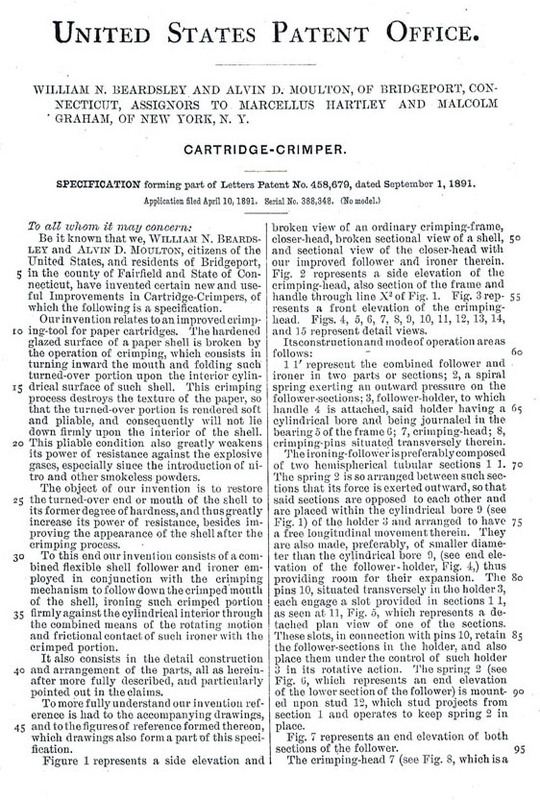 A search for information on the crimper eventually lead to the 1899 Hartley & Graham Arms and Ammunition catalog (available from Cornell Publications-www.cornellpubs.com, along with an impressive 5000+ other catalogs and gun manuals). 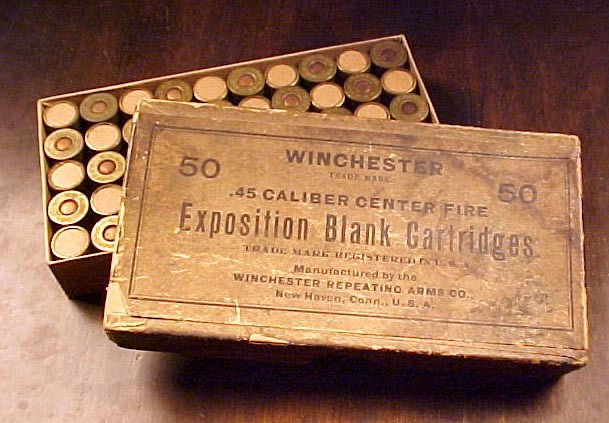 The catalog states that Hartley and Graham were the agents for The Union Metallic Cartridge Company, The Remington Arms Company, and The Bridgeport Gun & Implement Company; in actuality, they owned all three companies. 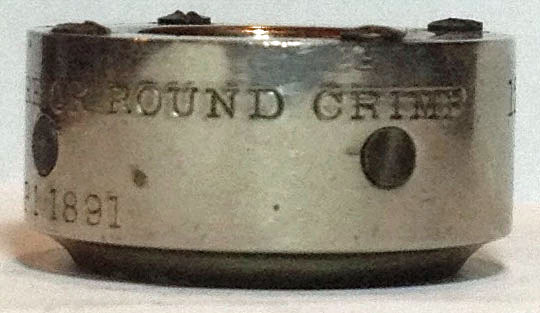 This crimper was listed in the catalog as the #3 Handy Closer, which sold for $27 per dozen, ($2.25 each). 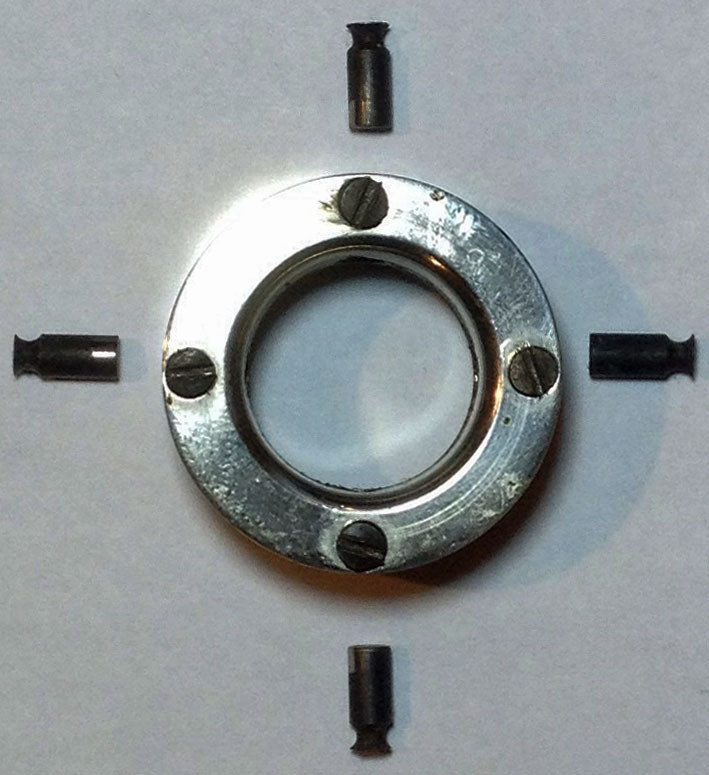 Unfortunately, the description provided little in the way of directions for using it, but did state that the crimper's 'reversible pins' were 'adjustable to give round or square crimp(s) as preferred'. Which brings me back to the first clue I had that this was not your run-of-the-mill crimper, this being the markings on the crimping head. These are in two lines that go around the outside of the head, as can be seen in the set of four photos here. 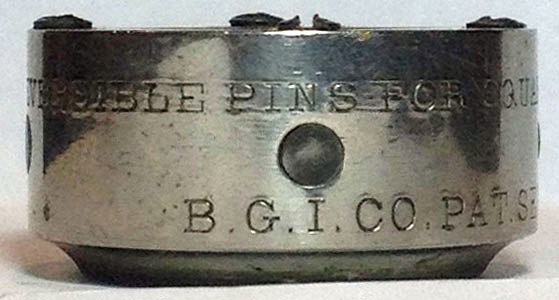 The top line reads 12 (gauge) REVERSIBLE PINS FOR SQUARE OR ROUND CRIMP. The second line reads PAT. SEP.1 1891. Searching on this patent issue date, I was able to locate the patent on the US Patent and Trademark Office web site (www.USPTO.gov). 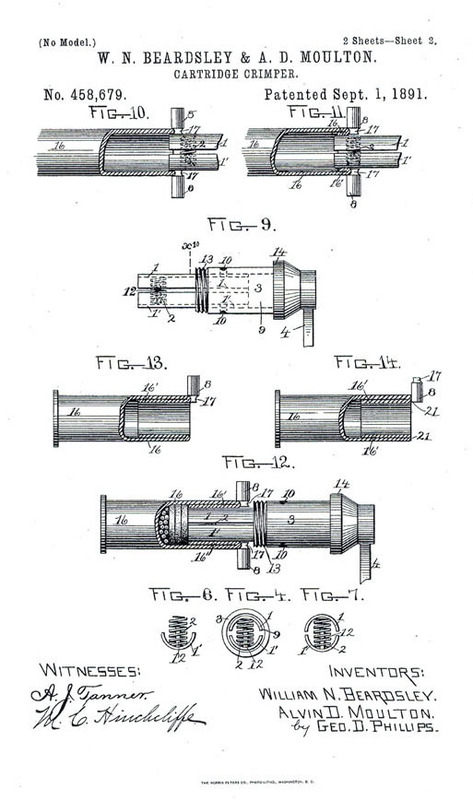 I have included copies of the patent drawings and specifications at the bottom of this page. 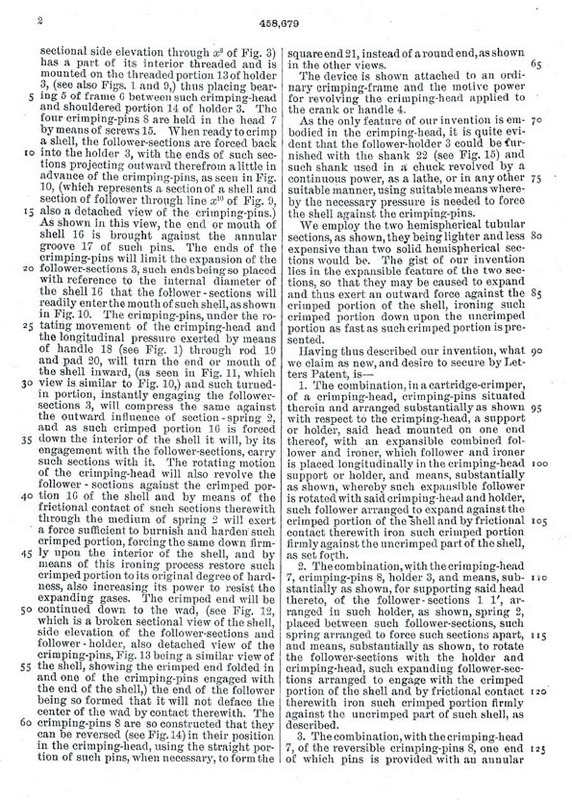 The patent was issued to W. D. Beardsley and A. D. Moulton, who assigned it to BGI. 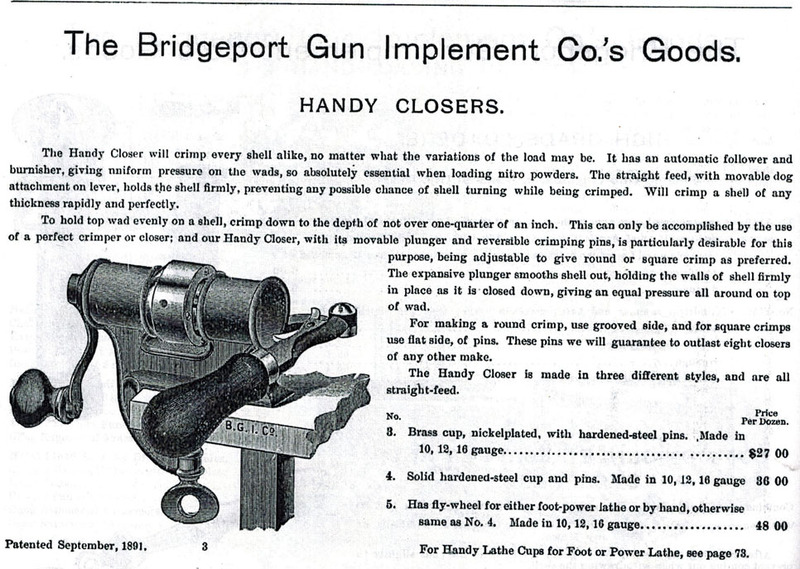 I have no idea what difference the shape of the crimp makes, but Mr. Beardsley and Mr. Moulton, as well as BGI, must have considered it important enough to allow shotgunners the opportunity to have the choice. Knowing that the four pins, the bases of which look like dark 'spots' around the perimeter of the head in the pictures, could be reversed, I was determined to figure out how that was accomplished. I fooled with it for a bit and decided that the head had to be removable to be able to get at the pins, but figuring out how to remove it without breaking the tool eluded me. With the patent drawings and specifications, or perhaps in spite of them, I eventually figured out how the crimping head was removed. As lawyers are involved in the patent process seemingly for the sole purpose of making the patent specifications as difficult to understand as possible, they tend to be nearly impossible for those among us with less obtuse thinking to interpret. It's the patent drawings that we generally have too depend upon if we are going to get anything at all out of the patent. 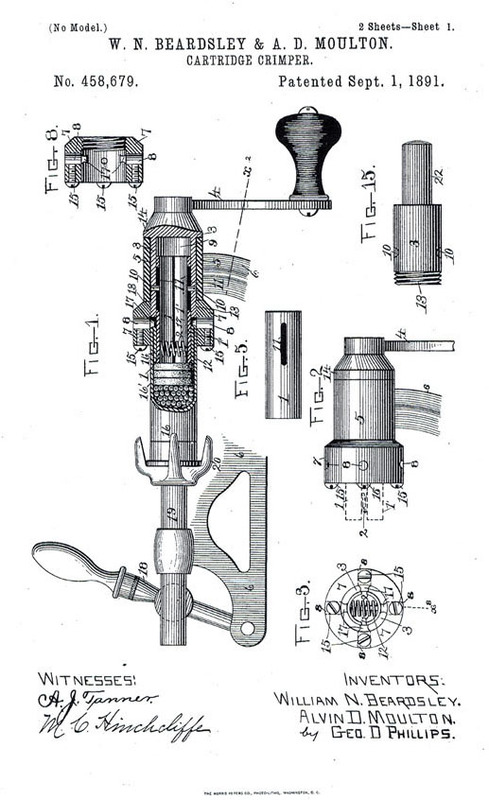 Once I had convinced myself that the crimping head was screwed to the shaft of the handle (note the threads on figures 8 and 15 at the top of the first page of the patent drawings) and that I wouldn't break anything by holding the head securely and turning the handle counter-clockwise, removing it and figuring how to make the changes necessary to produce both crimps was pretty easy. 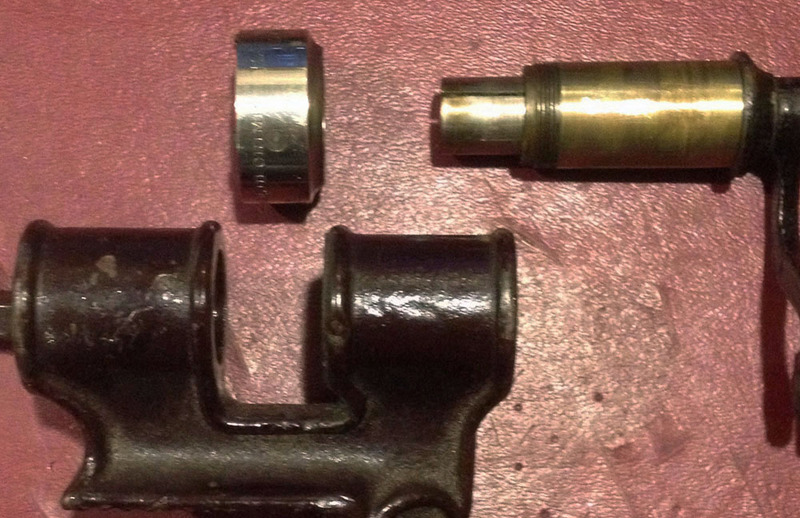 Having removed the head from the crank handle shaft (upper left photo), it becomes readily apparent that the key to the different crimps would be the four pins that can be seen extending into the center opening of the crimping head (upper right photo); as positioned in the head, the pins are set to produce rounded crimps. 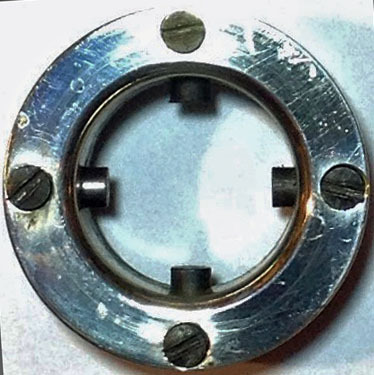 By backing out the four set screws that hold the pins securely in the head, the pins can be removed, reversed (as shown in the photo to the left) and slipped back in the head. Tightening the set screws completes the process, leaving the pins in the position to make square crimps (as shown in the picture to the right). So, now that I had the crimper all figured out, how well did it work? 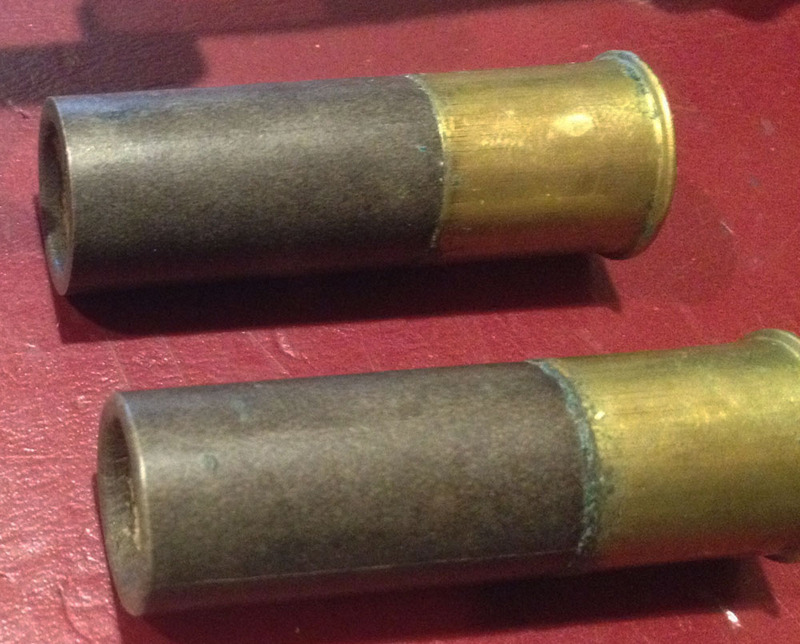 Quite well, in my opinion; the shells in these two photos show the different crimps. 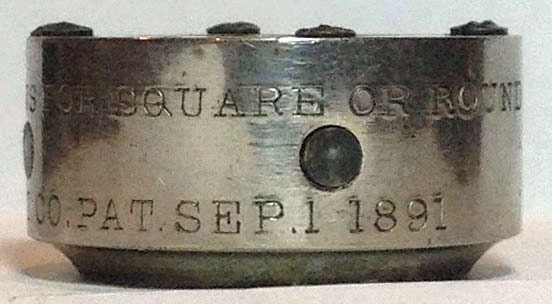 The square crimp is on the right in the picture on the left, and on the top in the picture on the right.